A Parkland father responded to a comedian's joke about school shooting survivors. 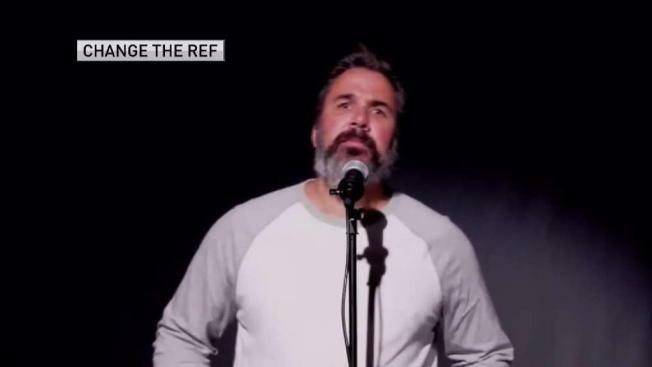 Manuel Oliver, the father of Parkland school shooting victim Joaquin Oliver, delivered a chilling "stand-up" set in response to recent controversial performances by comedian Louis C.K. Oliver, who with his wife founded the Change The Ref non-profit that supports student activism and promotes gun control, took to the stage for a video in which he feigned making jokes about "kids getting shot" – a reference to C.K. 's performance. C.K., the comedian who left the spotlight after acknowledging and apologizing for sexual misconduct in November 2017, delivered a stand-up set in which he mocked Parkland shooting survivors-turned-activists. "You're not interesting because you went to a high school where kids got shot," C.K. said during the Dec. 16 show in New York. "Why does that mean I have to listen to you? Why does that make you interesting? You didn't get shot, you pushed some fat kid in the way, and now I gotta listen to you talking?" The backlash against the comedian was immediate. In a January comedic performance in California, C.K. referenced both his sexual misconduct and the joke about Parkland. C.K. suggested that if anyone needed people to forget about their sexual misconduct, "what you do is you make a joke about kids that got shot." You heard the one about the kid that walks into the school on Valentine’s Day? Skinny kid, wearing headphones, gets dropped by his dad. And he says, 'I love you,' and gets out of the car and walks into the school. And then gets shot to death a couple of hours later. You guys ever heard dead baby jokes? I got a dead baby. His name was Joaquin Oliver. He was going to be 18. But now he’s dead. And that’s not a joke." Joaquin appears in the video. He tells a joke and drums out a rimshot after the punchline. "Why didn't the skeleton cross the road? Because he didn't have the guts!" Joaquin, who was among the 17 shot dead on Feb. 14, 2018, at Marjory Stoneman Douglas High School, says. The video closes with text urging viewers to "have some guts" to "stand up to gun violence" – followed by #NotAJoke.